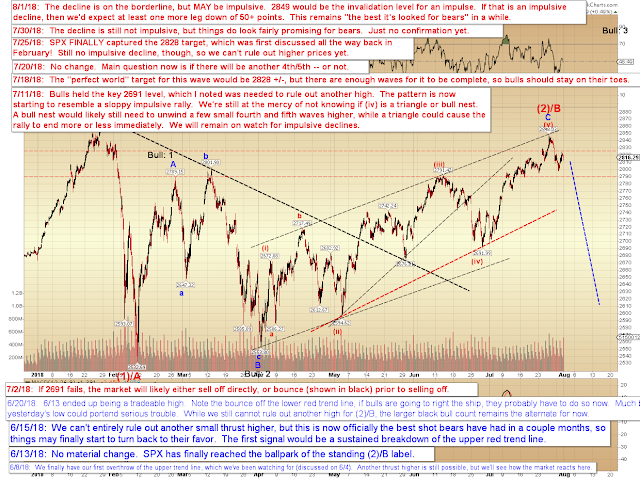 Last update I wrote that my first inclination was that lower prices were due and that the bottom was not yet in, and the market promptly made a new low. The decline from 2848 appears reasonably impulsive, but it's not a sure lock. Maybe 60-40 in favor of the decline being impulsive. In that event, the recent high should hold, and we would expect another leg down of 50+ points against the prevailing reaction high. Today's a Fed day, and that often means shenanigans, so stay nimble. In conclusion, we did get a new low as suggested last update, and -- for the moment, anyway -- this still remains the most promising pattern bears have seen in quite a while. Trade safe.